Durham ARC had a successful day at the 2015 British Rowing Indoor Championships held at the Lee Valley VeloPark in London on December 12th, bringing home 3 gold medals, with Joyce Collett winning in the Lightweight Women’s category for ages 60-64 over both the 2km and 500 metres distances, and Roger Stainforth securing victory in the Open category 2km for ages 70-74. 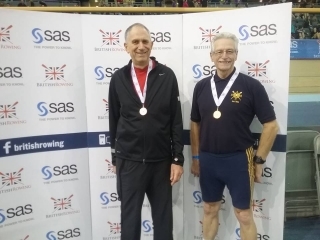 Roger is no stranger to indoor rowing competition, having won several times previously in national championships as well as setting British age category records. Victory in a time of 7min 15.6sec gave him 3 consecutive British titles. He now looks forward to the Irish and English championships in January 2016. Joyce was taking part for the first time in the British Championships, having taken up indoor racing only a year ago and having won already over the two distances at the English Championships in March. Cheered on by her sister and nephew she achieved a personal best time of 8min 25.3sec in winning the 2km event and achieved 1min 57.0sec for the shorter distance. Her success acts as a glowing recommendation for the Explore Rowing programme from which she graduated in 2011. The Championships take place using Concept2 ergos and is open to anyone to enter. 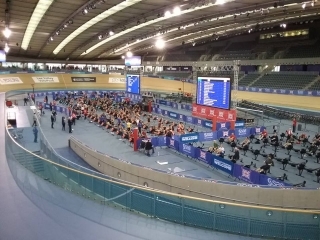 This year’s event attracted thousands of entries, with competitors of all ages and from around the UK taking part in individual and relay races. Among the other highlights of the day was Mo Sbihi of Team GB breaking Matthew Pinsent’s 11 year-old British record with a time of 5min 41.8sec for the Open men’s 2km distance. There are YouTube highlights from BR and all the results are on the British Rowing website. This entry was posted in Racing News on December 15, 2015 by Colin Lawson.